So I have been here a few times now... and I can see why some people call Kuma's the best burger in Chicago. They have a huge variety of toppings and also make a delicious vegetarian patty that my friends crave. The atmosphere is like a motorcycle/rock bar and can be a little unpleasant for some people; but overall, the food is what matters and they do well! Definitely try one of their creative combinations of burgers or even their mac & cheese. Sorry for not having additional pictures... I will be adding some eventually. The main reason for not getting a perfect rating is because of location and size of the restaurant. Every time I go to Kuma's, the parking is hard to find and the line is minimum hour wait. It can be disappointing to always have to take-out from such a great place. The last time I went to Kuma's, I decided on the GoatSnake burger. This huge burger was topped with herbed goat cheese, poblano corn relish, a lemon vinaigrette, and buttermilk battered fried red onions. The best part about Kuma's in my opinion is the toppings. They have a very generous hand when topping burgers and in fact, sometimes add a little too much. The onions were thinly sliced and deep fried, making them crispy. They added a nice sweetness to the burger which was cut by that lemon vinaigrette. The goat cheese was very creamy and rich, but retained that flavor that every associates with goat cheese. The bun was perfect and the burger at medium rare was just right. I couldn't complain about anything on this burger... Incredible! My friend was unable to eat a burger at this time... but she did go ahead and order the build your own Mac & Cheese. You get to choose two items from a list that includes bacon, prosciutto, chicken, roasted red peppers, sun dried tomatoes, caramelized onions, and garlic, just to name a few. There are easily a handful or more additional toppings to sort through... and if you want more, only a slight upcharge of $2.00 is added. The portion is out of control... it is enough to feed at least two or three people, or just enough for a couple days worth of left overs. The consistency is a great balance between the liquid-creamy texture and the well-formed casserole type. My friend ended up choosing caramelized onions and sun dried tomatoes which was an excellent combination. The sun dried tomatoes were the stronger of the two flavors but the cheese and onions still shined. Delicious and highly recommended. One of my other friends asked us to bring back a burger for her. She wanted the weekend nacho burger, but substituted with a 10oz garden burger patty. This well formed and well flavored patty is topped with Merkts cheddar cheese, jalapeño, pico de gallo, pickled red onion, tortilla strips, and cilantro. It is essentially a Mexican burger minus the beans and rice. I actually was able to try a bite of the veggie burger, and it isn't that bad. I know a lot of vegetarians enjoy the burger from here, especially with the amazing pretzel bun and those homemade chips. Getting burgers "to go" from Kuma's is not as good as eating at the establishment, but it is sure far from disappointing. Even with a veggie patty, this Kuma burger is highly recommended. This visit to Kuma's, I decided to get the Megadeth burger. It was their normal 10 oz. beef patty cooked medium rare (my choice) and then piled high with chorizo, a red potato hash, tortilla strips, a cayenne avocado cream, and an extremely fresh pico. Each component contributed nicely to the complex southwestern type flavor they were going for. The burger was cooked to perfection and was served on a pretzel bun. I really enjoy pretzel buns because of their unique flavor and also because it provides a solid base to the burger itself. It soaks up all the juices and holds up against all the toppings. 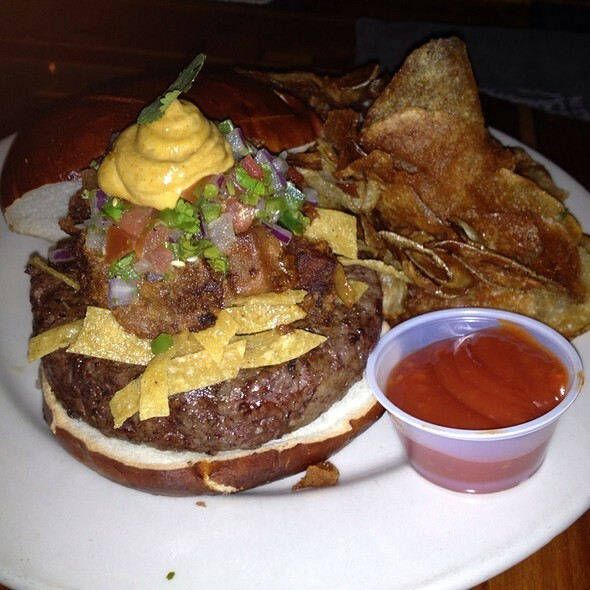 I suggest getting the homemade potato chips with the burger. Kuma's has decent french fries, but their seasoned chips dipped into some ketchup and hot sauce makes this meal even more unreal. - One of my other favorite burgers (not pictured) Lair of the Minotaur... It is a poached pear and is topped with brie cheese... it is simply amazing. - Don't expect to get a seat... especially if you come at normal eating hours. This place has minimal seating which can be very disappointing for some. - Don't come in a large group. I think they have one, maybe two tables larger than 4 people. Unless you want to get split up, the wait will be next to forever.